A moving collection of distinctly Australian poems about love, marriage and family life. These are love poems with their eyes wide open and scars defiantly on display, quietly optimistic but grounded in an acute understanding of the tragedies which people accumulate through life. 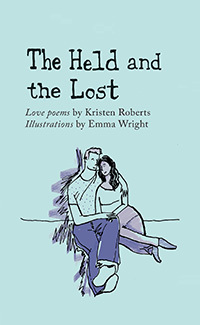 Roberts’ measured descriptions of enduring love temper sadness with notes of beauty and transcendent joy. Kristen Roberts is a poet from Melbourne who loves writing on the front porch while her children play in the garden. Her poems have won several awards and been published in Award Winning Australian Writing, Quadrant, Australian Love Poems 2013, and page seventeen. This is her first solo collection.